Eschscholzia elegans is rather enigmatic. The type collection is from Guadalupe Island, an oceanic island off the coast of Baja California, and it may be restricted to that island, although I have seen a specimen from Cedros Island that matches the type. 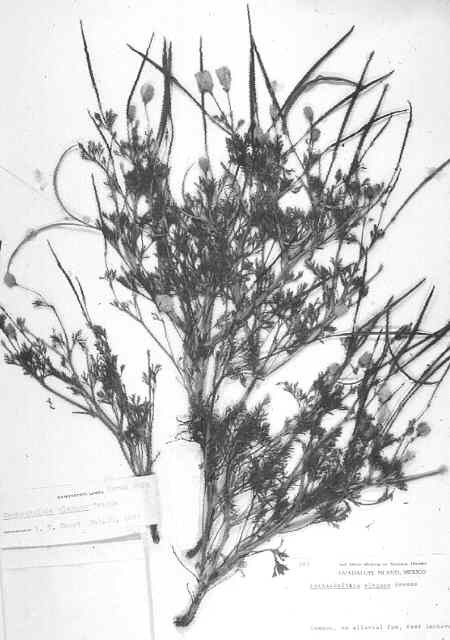 Its appearance is similar to E. ramosa, and its chromosome number of n=18 would place it in a polyploid series with that species, but its seeds more resemble the shrubby Eschscholzia palmeri. I suspect that the type may be a first-year E. palmeri plant, and that the bulk of the other collections represent a relative of E. ramosa.